We all know how good the champion New England Patriots are, and people are picking the Pats to once again take home the Lombardi Trophy in February of 2018. While the Pats are the favorites, NFL.com has a piece out about six teams that have a legit chance to unseat the champions from 2017, and the Raiders have made the list. 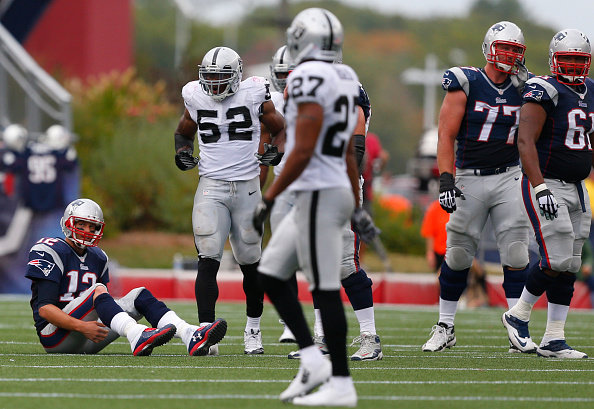 Here’s what Conor Orr had to say about the Raiders and their chances. Regular-season matchup with the Patriots: Nov. 19 (Week 11) at Estadio Azteca in Mexico City. Why they can do it: The addition of an apparently still-beastly Marshawn Lynch gives this matchup some heat. Oakland has the experience at offensive line and the ground-game counterpunch to potentially score with New England, should the game bend a certain way. On paper, the defense has also improved, though probably not enough to significantly trip up the mechanically proficient Brady. Having Khalil Mack, perhaps the best defensive player in football, able to rush from various spots on the field could be effective — much like how the Texans derailed New England’s offense for part of their playoff matchup last season by knifing rushers into the A-gap. Mostly, we are putting a tremendous amount of faith in a still-ascending Derek Carr. Could he put it all together and maximize Lynch and the receivers at his disposal?